Anthology films: I love everything about them, from their attention deficit-conscientious portioning to their dependable inconsistency. The short-form nature of the genre gives writers, directors and actors an opportunity to throw caution to the wind and get a bit more madcap or edgy or over-the-top than they might in a pricier, more time consuming standalone feature. 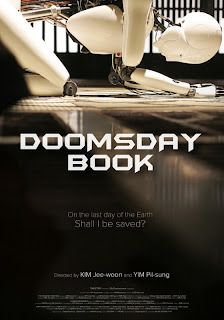 With DOOMSDAY BOOK, South Korean filmmakers Kim Ji-woon (A TALE OF TWO SISTERS) and Yim Pil-Sung (HANSEL & GRETEL) deliver a trio of apocalyptic scenarios that dally in three distinct types of science fiction, all the while sharing a single conceit: when the third rock goes pear-shaped, humanity will only have itself to blame. 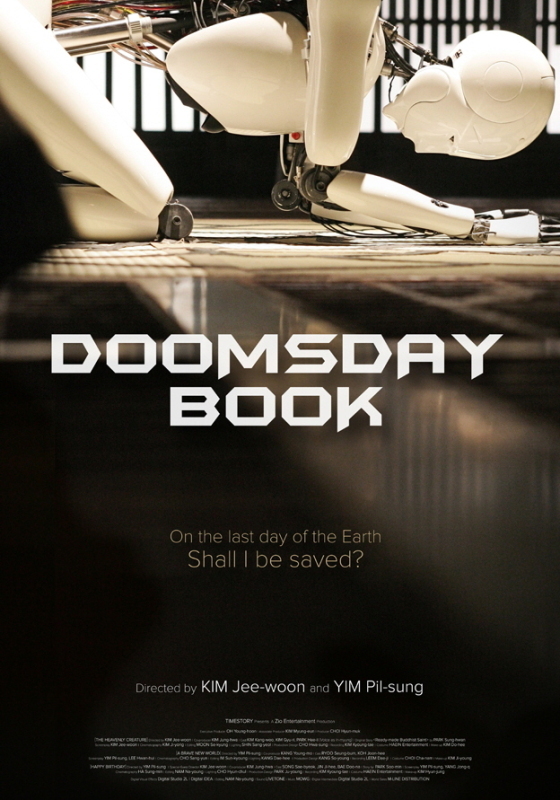 DOOMSDAY BOOK opens with a Yim Pil-Sung entry entitled Brave New World, in which careless waste disposal and janky food preparation collide, pitching Seoul into a full-on zombie outbreak and ruining our lonely, young protagonist’s chance for love. This one is easily the film’s weakest bit, and it still isn’t overtly terrible… it just lacks the spark of originality that marks the other two stories. Ji-woon’s segment, Heavenly Creature, tells the story of a Buddhist monastery with a doozy of a head-scratcher for tech support: not only has their helper robot achieved self-awareness, but also enlightenment. So is it a technical glitch or a function of the robot’s own individual heightened consciousness? While Creature is the segment farthest removed from the film’s doomy overtones – robot sentience is off-handedly acknowledged has a possible threat to humanity, but the story never veers in that direction – it’s also the most satisfying and fully realized. Aside from a shruggy plot twist in the form of an unnecessary epilogue, it’s a graceful and philosophically robust bit of sci-fi writing. Tugging at the seam between faith and science, the piece presents the notion that if man can make a machine capable of calculating without error, he could also make a machine capable of reasoned belief without doubt. It’s beautifully filmed, and makes a solid argument against humanity’s will to perfection, as well as a strong case for doubt as faith’s animating factor. Also: robots! That brings us to Pil-Sung’s Happy Birthday, a strange and fantastical story about a young girl who inadvertently places an online order for the rapture. Easily the film’s funniest bit, sprinkled as it is with infomercials for end-of-the-world sundries and doomsaying newscasters whose journalistic objectivity is crumbling faster than human civilization, Birthday is at once a darkly prescient apocalyptic comedy, an Outer Limits-style sci-fi brain-twister, and a joyful paean to the magic of the universe’s limitless unknowability. It doesn’t always makes sense… but it’s more fun than a lot of things that do.